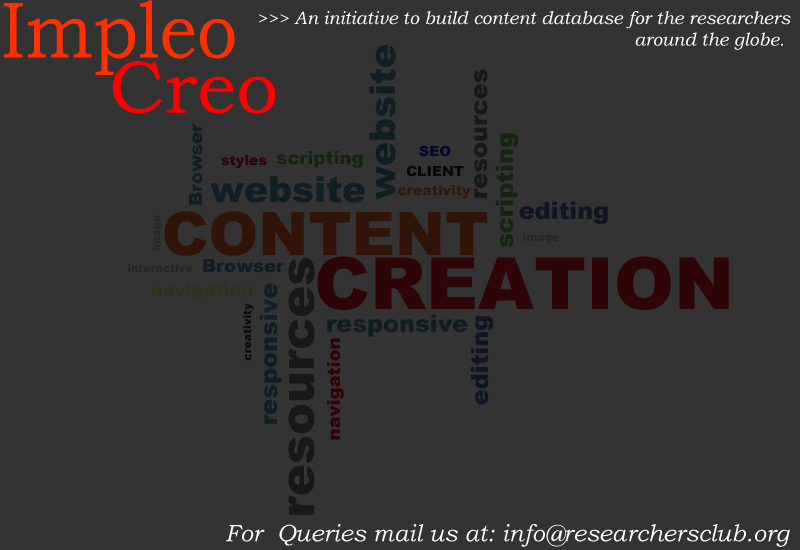 Impleo Creo, which basically means content creation is an initiative taken by researchers club for all the researchers across the country in which students, lawyers, academicians, and professors can submit their research work, projects, presentation and research papers to us and that would be published on the website of Researchers Club. This initiative would help students and researchers to show their research works across the globe.If any of your articles are published in any journal, you can write a summary or abstract of that articles and send it to us with the link wherever it is published. People whoever would help us in creating this will be awarded by CERTIFICATE OF APPRECIATION and would be sent online to their respective mail ids.